1967 Lone Star Limited Edition Mustang was territorial special for Texas just as the High Country Special was for Denver and the California Special for California. They came with a special Blue Bonnet paint - they came to be known by the name Bluebonnet Special. All 175 Lone Star Mustangs were hardtops, had the sprint options package, blue luxury interior, steel styled wheels, 200ci in-line six or 289ci V8 engine, and had a gold Lone Star Limited fender badge. 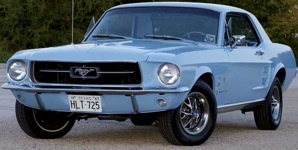 This is a Lone Star Limited 1967 Mustang hardtop (AKA Bluebonnet Special). It's a one owner car owned by Bobby Blankenship. This is our featured Attitude Of The Week for the week starting August 26, 2012. Bobby adds, "I bought the car new from the local Ford Dealer in August 1967. It is 90% original, no rust and no bondo. It was repainted in 2007, other than that it is original. I have a 1969 set of wheels on it, but I have the original wheels and wheel covers. The car has 67000+ miles on it. Always garage kept." It's here! A new Texas Ford Dealer exclusive! Special Limited-Edition Mustang... says a Ford advertisement in the May 11th, 1967, edition of The Gilmer Mirror newspaper of Gilmer, Texas. It says, This specially built, custom-equipped Mustang Hardtop is a Lone Star exclusive. Texas Ford Dealers have ordered all they can get - and you still won't see many around because this is a special limited-production model. Check the extras you get - all included in the special low price! GT hood with built-in turn signal indicators, rocker panel moldings, wheel covers, chromed air cleaner, whitewalls, vinyl-covered shift lever (with Cruise-O-Matic option), Lone Star Limited emblem. This ad was placed by the Long Motor Company. The same ad was placed by Bill Utter Ford in the April 14th, 1967, edition of the Denton Record-Chronicle newspaper in Denton, Texas.